Mountain View, Calif. – July 17, 2014 – Appcelerator® today unveiled new capabilities to the company’s category-defining mobile engagement platform, making it smarter, more connected and more flexible than ever. As “business as usual” moves from websites to apps and PCs to tablets, Appcelerator has set the standard for how enterprises embrace the “post-web” reality. The Appcelerator Platform combines leading native cross-platform app development and testing capabilities with innovations for mobilizing data and measuring success via real-time mobile analytics – all so companies can drive intuitive and engaging mobile experiences, quickly and at scale. Mobile apps have quickly become the default way people access information, make purchases and get work done. They’ve also forced companies to fundamentally rethink how they engage with employees, customers and partners – and the technologies required to support those interactions. The Appcelerator Platform speeds time to market with native cross-platform app development & testing, simplified access to data via mobile-optimized APIs, and real-time mobile analytics to power user engagement and measure success. It has fast become an industry standard for the mobile enterprise – leading brands such as Comerica, Family Dollar, VMware, Sprint and Avis rely on Appcelerator to deliver portfolios of increasingly powerful, purposeful and multi-device app experiences. Smarter: Most enterprises are moving from a few apps to dozens, if not hundreds, and build more every month – without a reliable way of measuring true business impact. Appcelerator’s newest mobile analytics capability, Insights 2.0, delivers real-time visibility into the five key mobile metrics necessary for any successful app: acquisition, engagement, retention, quality and conversion. 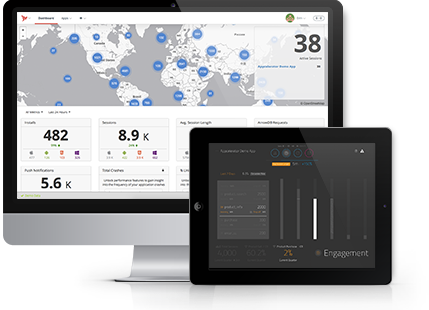 Insights 2.0 displays all of this rich information through a single, tablet-based view designed for business stakeholders, IT leaders and company executives. In one recent instance, Safeguard Properties, the largest privately-held mortgage field services company in the United States, used the Appcelerator Platform’s mobile analytics to quadruple adoption of an important business app in less than six months. More Connected: Apps don’t work alone – they require connection to an exploding number of data sources, both within and outside of the enterprise. For most companies this means laborious hand-coding of specialized data integrations for mobile consumption. The Appcelerator Platform’s new API Builder eliminates this, offering developers a simple, powerful point-and-click interface to assemble mobile-optimized APIs quickly and easily, freeing up valuable time to focus on creating great mobile experiences. By making mobile-optimized APIs readily available – alongside connectors for enterprise data sources and a host of essential mobile services such as push notification and photo storage – the Appcelerator Platform lets mobile teams focus on innovating rather than integrating. The Appcelerator Platform provides the elastic scale crucial in a mobile world, orchestrating more than 1.5 billion data API calls per month. More Flexible: With full native SDK support, the Appcelerator Platform’s entire suite of capabilities can now be applied to any app in a customer’s portfolio – regardless of whether it was built on the Appcelerator Platform or directly via native SDK (iOS and Android). This includes almost instant visibility via the Platform’s mobile analytics dashboard, so that virtually overnight customers can begin real-time tracking of all their mobile app investments. The Platform, long available in public or virtual private cloud deployments, also now includes a private cloud deployment option for organizations whose regulatory requirements prohibit off-premises hosting.